When changes in their professional lives brought Faith and Mark Dymek and their family to Southern California from the Washington, D.C., area in 2004, they had little idea what was in store for them. Born and raised in the Midwest—Faith in Nebraska, Mark in Illinois—they had been given one piece of advice by Mark’s new Southern California–based associates: look for a home in Pasadena, the Southland city that most resembles the country’s heartland. They also brought with them a houseful of Craftsman furniture, much of it in the Prairie Style that reflects their roots, which they had acquired over the 20 years they had been married—the kind of furniture in whose serene, hardy aesthetic they had recognized their values, their family histories, a sense of who they are. 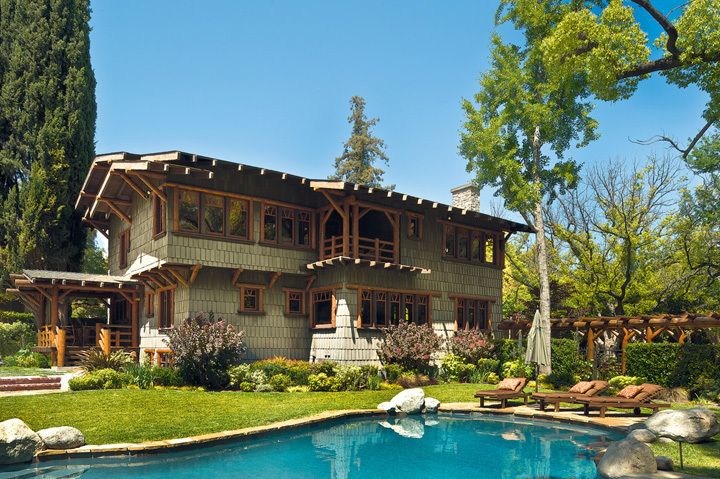 It was fitting, then, that they began their search for a home by looking for Craftsman houses in Pasadena, preferably older ones built during the early decades of the 20th century, when the Craftsman style was in its heyday and Pasadena was its epicenter. This was 2004, however. The housing market was booming. 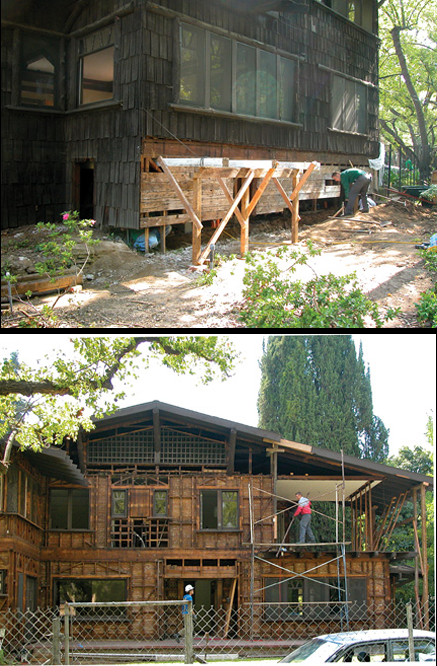 And as it happened, there was only one vintage Craftsman home on the market in Pasadena: a dark, two-story redwood place built in 1909 that had been sitting empty for years on an overgrown lot in the venerable, built-up Oak Knoll neighborhood that is also home to the Greene & Greene Blacker House. Mark discovered it at a Sunday open house while Faith was still back in Virginia. 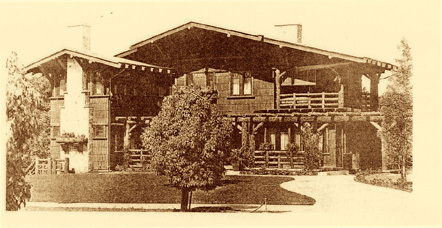 An illustrated 1911 article in American Homes and Gardens had described the house, in the quaint rhetoric of the day, as “an interesting application of Swiss architecture for American use.” As the old photographs showed, it had been modeled on a Swiss chalet, with a pergola of rough, “bark-on” redwood logs across the front, sitting on a low rise behind a curving driveway that entered from the street through an imposing log gateway, of the sort you might expect to see at the entrance to a grand hacienda or a sprawling ranch in a classic Hollywood Western. By that Sunday in 2004, the logs that featured so prominently in the old photographs were long gone. 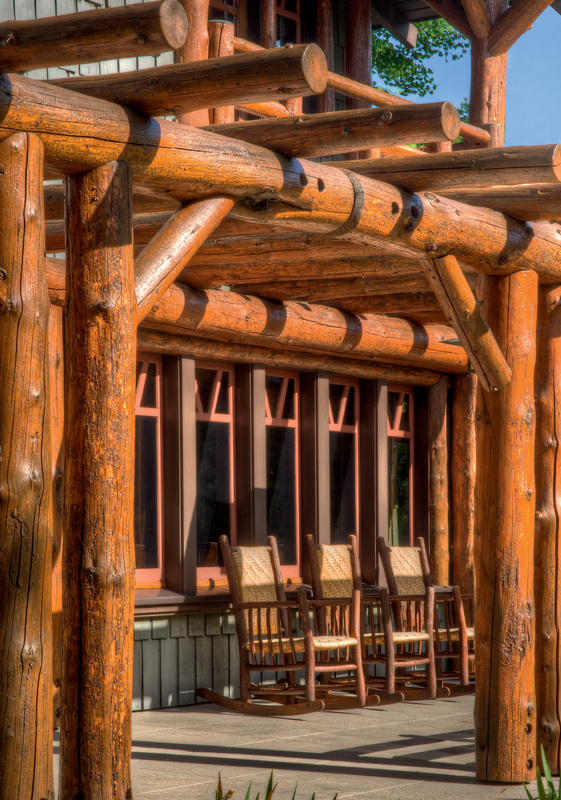 The dramatic front pergola had been taken down in the 1920s, when it began to come apart after more than a decade of exposure to sun and rain. The front gateway and another log pergola in the side garden had both eventually toppled and had never been rebuilt. 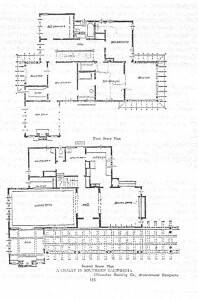 Although the kitchen had been vinylized and the open-air sleeping porch on the eastern end of the second floor had been awkwardly glassed in, the house’s string of owners had done relatively little to it, good or bad. It was as if they had simply let it go to seed, not quite knowing what else to do with it. In spite of these deprivations, Mark sensed the property’s potential. And Faith, a descendant of farmers and woodworkers like her grandfathers, whose skill and grit she revered, was willing to take a chance, especially when they saw what it had looked like in its prime. “We began to sense a momentous opportunity—almost a responsibility—to restore a unique historic property,” she says. The question was whether that would even be possible, given that all they had to go on were some old photos. It didn’t hurt that one of Pasadena’s most esteemed architects, Douglas F. Ewing, FAIA, had also been interested in the house. He and his wife had given up the idea of buying it themselves only after failing to come to an agreement with the owner, who had bought it with the sole intention of flipping it. In his last act as a would-be buyer, Ewing had given the listing broker his portfolio book and asked him to tell serious buyers, if there were ever to be any, to call him. 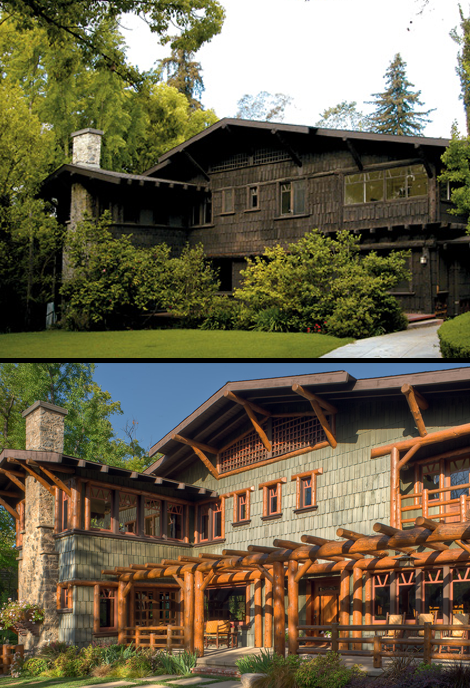 Having grown up and pursued a distinguished career in the midst of Pasadena’s Arts and Crafts masterpieces, he had designed and carried out more than 40 national and AIA award-winning restorations of historic buildings, in addition to more than a thousand design projects throughout the U.S. and around the world. 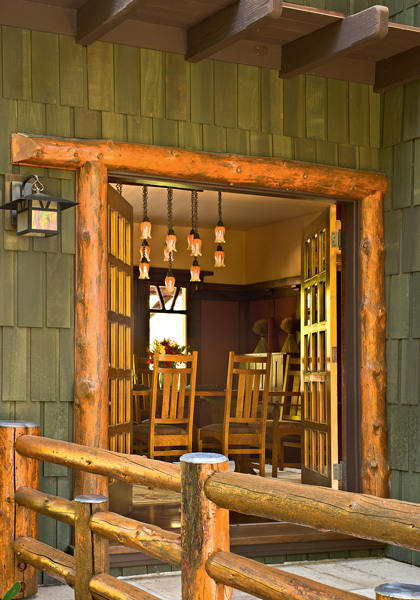 Intriguingly, he had also developed a love for the rustic log architecture of the Adirondacks and had adapted it to the design of several Montana ranch houses. He, too, could see the potential in this obviously distressed property, and if any other prospective buyer was willing to take a chance on it, he knew he could help. He was right. That work got underway early in 2005, when the house was jacked up so that the crumbling dry-stacked brick foundation could be replaced. “That hurt,” Faith says. 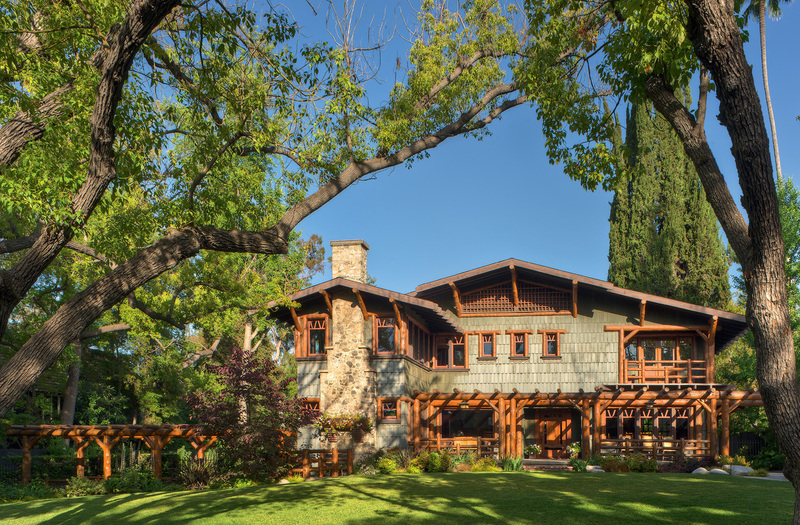 But the Dymeks had Ewing’s drawings to remind them that this was not a demolition; it was the preface to what would become a stunning restoration, one that had strong support from the city and from Pasadena Heritage, the pioneering local historic preservation organization. While the prep work was going on, a crew at Montana Idaho Log and Timber in Victor, Montana, was spending the winter cutting, scribing and numbering the fire-killed and beetle-killed spruce and pine logs that would arrive in Pasadena in a semi in the spring, accompanied by a pair of loggers who would spend months at a time on the site over the next year, working with the reconstruction crews to restore the house’s original magnificence. With the Dymeks hunkered down with their daughter and Faith’s mother in a two-bedroom Pasadena apartment not far away, the major structural restorations continued. Two years later, at the moment the work had advanced to the point where moving into the house became thinkable(and as the walls of the apartment closed in on them), they moved. And in a house composed inside and out of wood in a myriad of forms and surfaces, all of them being meticulously replaced or restored to reverse nearly a century of benign neglect, they found themselves falling under the house’s spell. So did the crews doing the work, and—eventually—so did the neighbors. It became common for passersby to stop and comment to the workers, or to Faith or Mark if they happened to be there, on how wonderful the emerging building looked. One former owner stopped unexpectedly at the site one day when Faith was there, asked to see what the inside looked like, and while getting a tour pointed to a piece of original, unpainted trim where, so faintly one needed extra light to see the marks, the Ledyard family had recorded the heights of their children from 1910 through 1919. “Surprisingly—and thankfully!”—Faith says, it was a piece they had not yet refinished. 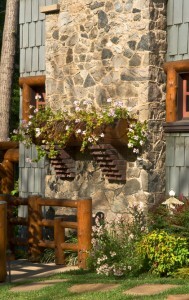 Toward the end of the project, one of the loggers who had created the timbered exterior in the Montana yard and who was at the Pasadena site on and off for months assembling and installing it, surprised the Dymeks with a log flower box he had built to replace the redwood planter, embedded in the fireplace chimney, that had been featured in the 1911 magazine article. It was a particularly poignant grace note, not only to the original house but to the intensely shared sense of dedication that had united everyone—the Dymeks, the Ewings, the construction crews and the restoration craftsmen—as the project moved to completion. The Dymeks’ sense of commitment is still strong today. Ongoing maintenance of the wood, and especially the carefully oiled logs, is an enormous effort, one in which their “wood guys” take special pride as they apply their yearly ministrations. “Living here is like living in another time, another place,” Faith says. “Every room has its own feeling of peace and calm and relationship to the whole that give you a sense of comfort in place, wherever you are. We have almost no window coverings, because the glass doors and the classic transom windows with their unique muntin pattern frame the views of everything so beautifully. Lying in bed in the morning, we can see outdoors—trees, sky, other parts of the house—through eight different sets of windows. The views themselves are a glorious part of the experience of living here. “At the same time, there’s a feeling of living as though we really were out in the woods. Even the nesting pair of ducks that showed up the first year and have returned every year since seem to agree, providing us with useful lessons in living close to nature.